Goodness. I have missed creating recipes and content. As you can probably relate, Fall was a whirlwind, and Winter hasn’t been any slower. It is cold and I’m all about comfort food right now, as I imagine you are too. We had a couple of teasingly beautiful spring days here in Texas and now it is to drop down below freezing this week. We had to put lights on our confused budding peach trees to keep them warm and cover our newly-planted tomatoes. If you aren’t from Texas, we have Winter…then Summer. If you don’t plant your ‘mater’s early enough…they get fried by summer time. But to get back to comfort food, I played around with a bunch of different recipes until I came up with this awesomeness-erolle. While I always love a good casserole, the dietitian in me dislikes all the high sodium cream-of soups they always call for. The mom-trying-to-keep-her-sanity in me, however, still wants it easily thrown together, who am I kidding? 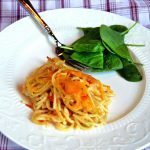 This Chicken Spaghetti Casserole manages to meet all this, and while it has has some butter and cheese, it is much less in fat, sodium, and preservatives than many recipes I have seen. And boy, does it warm your insides on damp, chilly day. Delicious comfort food without the “cream-of” canned soups. Preheat oven to 350 degrees. 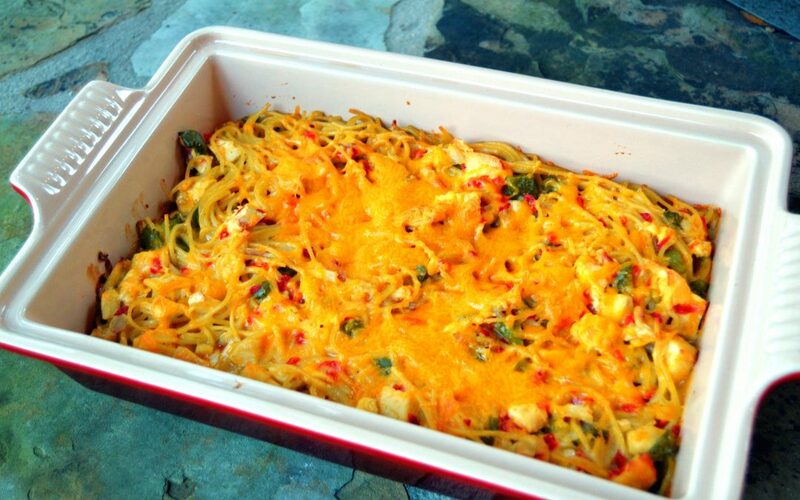 Coat a 9×13 casserole dish with non-stick cooking spray, set aside. Saute diced onion and pepper in olive oil until veggies are soft and onions are translucent. 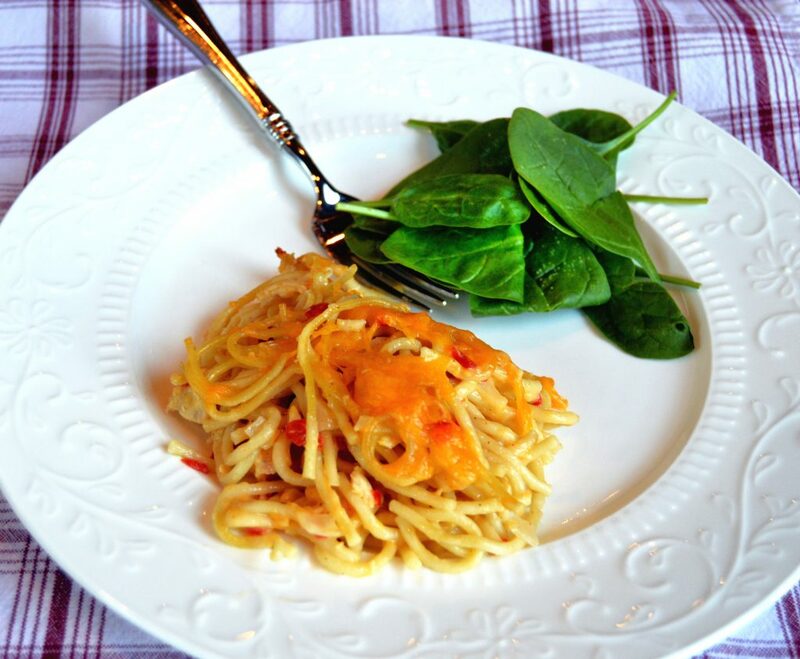 Bring spaghetti pasta (broken into thirds) to a boil in the 2 cans of low sodium chicken broth and 3 cups of water. Cook until pasta is al dente. Meanwhile, in a large bowl, combine the chopped cooked chicken, pimientos, seasonings except for garlic powder, and 2 cups of the shredded cheddar cheese. Add cooked onions and peppers. Drain pasta, but reserve 1/2 cup of the broth. Add drained pasta to the large bowl. Next, you will make a roux (wahoo fancy!). Melt butter in a saucepan, then add flour. Mix until you form a paste. Add roux to the large bowl and mix all ingredients well. Pour into the 9×13 casserole dish. Throw it in the oven and bake at 350 degrees for 35 minutes, uncovered. Pull it out, sprinkle with remaining 1/2 cup shredded cheddar cheese, and cook 10 minutes more until melted. Yank it out of the oven and enjoy! Great with spinach salad. I hope this casserole warms you up just like it does me! Do you have any favorite casserole recipes without any “cream-of” soups? If so, please share! And if you happen to be curious what is new for Food 4 Success, LLC this year and why I have been so MIA online, I will gladly share, because well…I’m excited and kinda like to talk about it to anyone who will listen or read this far. I am currently working on getting set up to take insurance (YAY! ), which will include Medicare and a few other private companies, so stay tuned. I also launched my new online learning platform, Food 4 Success eLearning last month. I haven’t made much noise about it because I only have 1 course on it right now for my gestational diabetes clients, but more information-packed courses are coming soon! I am also in the process of transitioning to an automated scheduler and electronic medical records platform, so if you are a client of mine, please bear with me if you receive any redundant emails in the beginning. I have also taken on a few more consulting clients that I am very excited to work with. Between that and chasing around a 4 year old boy and almost 2 year old little girl, it has been a ride to say the least! Stay warm out there and be kind to yourself! Until next time!